Parade, Parties & Dancing, Concerts, Fireworks on French National Day! 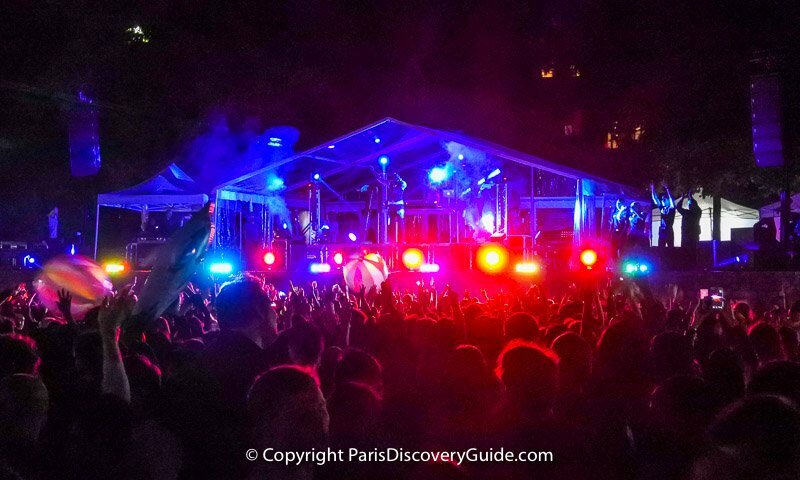 If you are lucky enough to spend Bastille Day - Le Quatorze Juillet - in Paris, you'll get to be part of the biggest summer celebration in the city. Bastille Day festivities always take place on July 14, the anniversary of the storming of the infamous Bastille prison in 1789 - a turning point in the French Revolution, and now a national holiday throughout France. 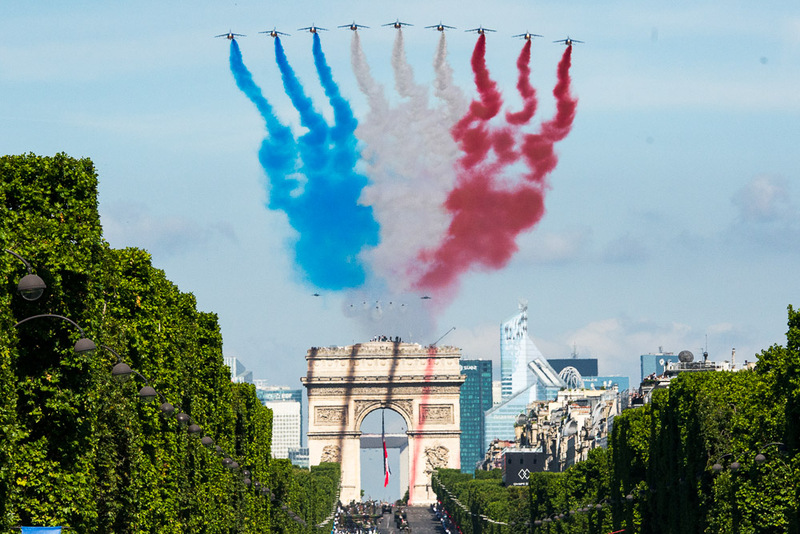 Celebrations kick off with a formal military ceremony followed by a huge military parade down the Avenue des Champs Élysées and flyover by military aircraft. A spectacular fireworks show at the Eiffel Tower on the Champ de Mars starts at 11pm and lights up the sky for half an hour. 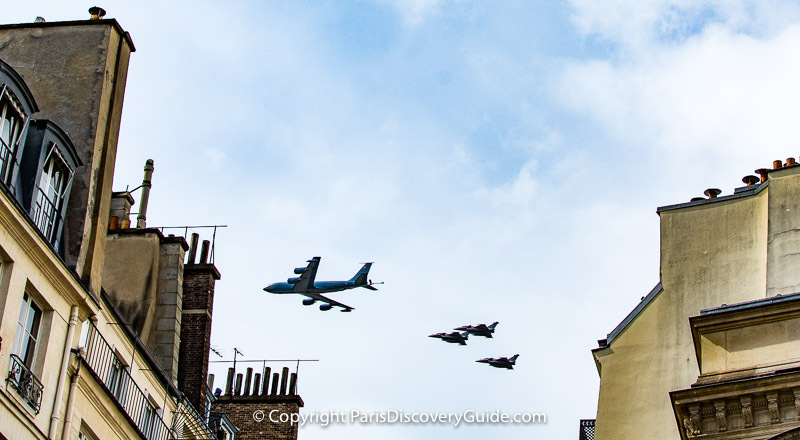 But there's a lot more to enjoy in Paris on Bastille Day, also known as French National Day. Gather on the Champs de Mars with a blanket and picnic to relax and enjoy free concerts before the fireworks, attend one of the popular Bals des Pompiers (Firemen's Balls), cruise down the river, or visit one of the many museums open for the occasion. Here are our best tips on how to celebrate Bastille Day in Paris. Bastille Day celebrations in Paris kick off at 10am with formal military exercises at the Arc de Triomphe, starting with an impressive trumpet, bugle, and drum fanfare to announce the arrival of the President of the French Republic, who inspects the assembled military troops and presides over other ceremonies and tributes. At around 10:45, a rather magnificent flyover of military aircraft takes place overhead. 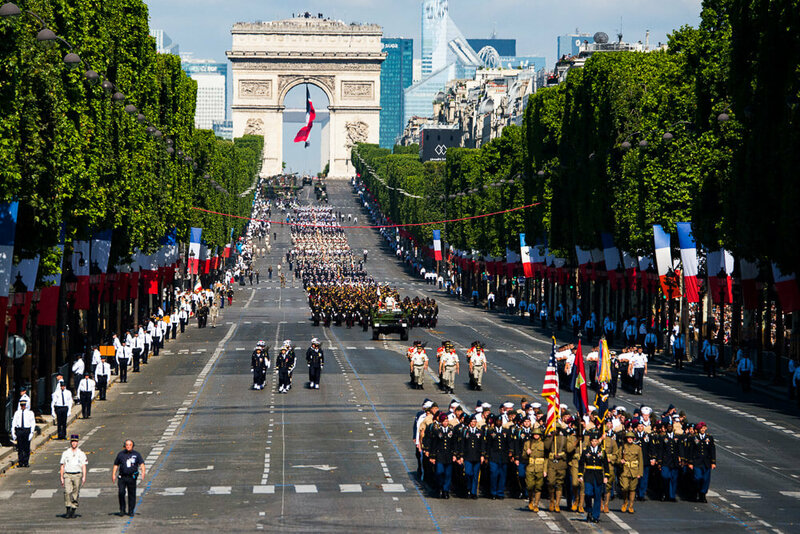 A huge military parade down the Champs-Élysées from the Arc de Triomphe to Place de la Concord starts at 11am and lasts about an hour. It includes representatives of elite French military regiments on foot, on horseback, and in vehicles - including tanks. If you want to stake out a good viewing position for the parade, plan to arrive by 8am or even earlier. Crowds are usually (unless the weather is bad) massive - partly because you must be behind the barricades, which does not leave much room along the sidewalks. If you want to be sure of a superb view, reserve one of the rooms or suites overlooking the parade route at the 5-star Paris Marriott Champs-Élysées. You should expect the rates to be pricy - but the views will be priceless. Or, you can also try to snag seats on the upper level of one of the cafes along Champs-Élysées by stopping by a day or two in advance and asking to reserve a window table. At least two metro stations in the area (Tuileries and Concorde) will be closed completely, and those along the Champs-Élysées (Champs-Elysées Clemenceau, Franklin D. Roosevelt, George V, CDG-Étoile) may either be closed or have only one entrance open. If they are open at all, they will be mobbed, so consider other nearby stations (Saint-Philippe-du-Roule, Terne, Alma-Marceau, Victor Hugo, Gare de Neuilly/Porte Maillot, even Invalides on the Left Bank). Champs-Élysées and other nearby streets will be closed to vehicles until 6:30pm, which means buses will be re-routed to avoid the area. So wear comfortable walking shoes, and bring a water bottle (or two). If you want to skip the parade but watch the military aircraft flyover, logistics are much easier - you can see the planes from many spots in the city. Nearby parks such as Jardin des Tuileries (Tuileries Garden) and the Esplanade des Invalides (on the Left Bank) are both ideal viewing locations because your line of vision won't be blocked by nearby buildings. 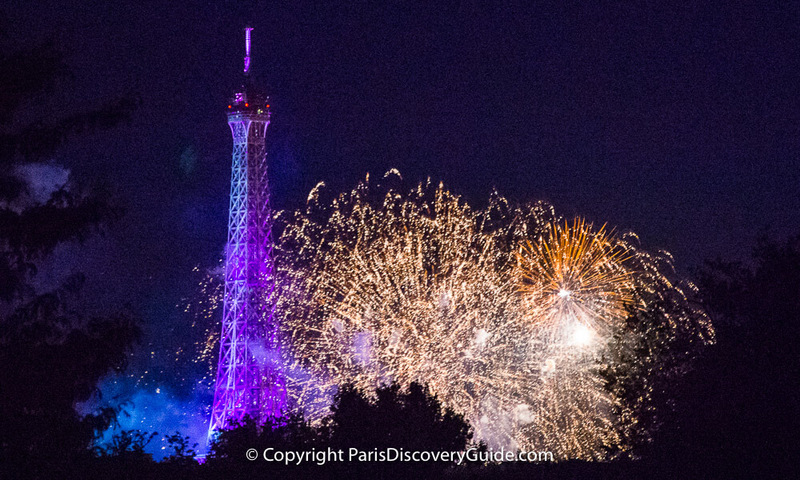 A truly spectacular Bastille Day fireworks show at the Eiffel Tower and Trocadéro Garden across the Seine sends dazzling bursts of light across the Parisian night sky. The show follows a different theme each year - and each year, you'll swear the display is the best ever. Many - up to about a million - Parisians picnic and relax all afternoon on the Champ de Mars, the large grassy park surrounding the Eiffel Tower. If you want to drink wine or champagne as part of your picnic, start early because alcohol is banned on Champ de Mars after 3pm. Champ de Mars is also the site of free open air concerts through the early evening hours. At 9:30pm, a special concert of classical music and opera featuring internationally acclaimed artists begins, with musicians performing from the base of the Eiffel Tower and special lighting effects. The fireworks start at 11pm, once the sky is finally almost dark, and last about 35 minutes. If you plan to spend the afternoon and evening at Champ de Mars, be aware that there are very few public toilets in this area compared with the number of people who gather for the concerts and fireworks. Area cafés will not let you use their facilities unless you are there for a meal - or at least a drink. You can find public restrooms at Parc Rives de Seine - the riverside park along the Left Bank of the Seine. You will be able to see the fireworks from any point in Paris where you can see the Eiffel Tower. For close-up views, another area that's almost as popular as Champ de Mars (and sometimes even more crowded) is Trocadéro, across the Seine from the Eiffel Tower. Here, too, you need to arrive early to stake out your spot. As with any densely crowded location, watch out for pickpockets. Other popular viewing areas that may be somewhat less crowded include the nearby banks of the Seine, bridges over the river, the area around Place de la Concorde, and even some areas of the Tuileries Garden (you have to pick your spot carefully here, due to the many trees). Keep in mind that numerous metro stations near the Eiffel Tower will start to close as early as 7pm: Dupleix, Ecole Militaire, Passy, Iéna, Trocadéro, Laa Motte-Piquet-Grenelle, and sometimes more, depending on security considerations. Most city buses will run, but be rerouted. You'll see signs about closures posted clearly in the stations. So to the degree possible, pick a viewing location that you can either walk to, or reach on a metro well beyond the security zone. Because of the massive crowds, this is not the night to count on getting a taxi or uber! 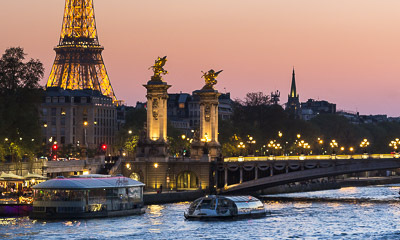 One of our favorites is this magical Bastille Day Dinner Cruise with a 6-course dinner, wine and Champagne, live music, and a perfect view of the fireworks from the deck. This cruise is on Bastille Day only and always sells out - so book early! After the Bastille Day fireworks end, festivities continue at les Bals des Pompiers (Firemen's Balls), organized by fire stations throughout Paris in a tradition that started a century ago. In case "ball" conjures up visions of formal attire and a stuffy ambiance, rest assured that these balls are just the opposite: informal, outdoor parties with lots of music, dancing, champagne, and fun. The Firemen's Balls take place on July 13 and 14, and start at 9pm and last until 4am. They are open to the public, and a wonderful way, if you're a visitor, to experience the "real" Paris! French History Refresher: Why Bastille Day is a French National Holiday? Similar to Independence Day on July 4 in the United States, Bastille Day celebrates the overthrow of a repressive monarchy and the beginning of democracy in France during the French Revolution of 1789. Although pressure against France's all-powerful rulers had been brewing for decades, revolution began in earnest in 1787 amid a severe economic crisis and an out-of-touch, ineffective king, Louis XVI and his wife, Marie-Antoinette. On July 14, 1789, anti-Monarchist forces in search of gunpower and weapons stormed the Bastille, a medieval fortress, and freed its prisoners. Although only seven prisoners were incarcerated, all for political non-reasons, the Bastille's past as a prison for political dissidents gave its fall great symbolic meaning to the revolutionaries. Perhaps equally important: Royalist troops stood by without intervening while this was happening - a signal heard across across Paris and the rest of France that Louis XVI no longer fully controlled his army. A few weeks later, on August 4, 1789, the French Assembly adopted the "Declaration of the Rights of Man and of the Citizen," which officially abolished feudalism and adopted a system based on equal opportunity, freedom of speech, and a representative government - thus undermining the power of the monarchy. The revolution raged on for another 10 or so years, finally winding down for awhile when Napoleon Bonaparte took control and the country adopted a new constitution in 1799. However, permanently eliminating rule by monarchy took two more revolutions - one in 1830 and another in 1848. 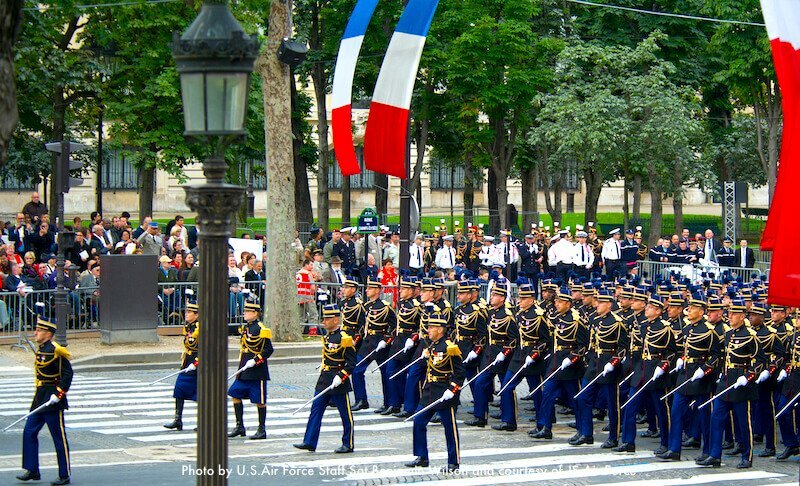 The first Bastille Day parade to commemorate the momentous event took place a year later in 1880, making it the oldest military parade in the world, and has continued every year since then, except during the years of the Nazi occupation during World War II. So if you are in Paris on Bastille Day, join in the festivities and raise a glass to salute France's hard-won liberté, egalité, fraternité! Most large museums, department stores, and shopping complexes in Paris will be open on Bastille Day. (Remember, summer sales are still underway!) The Arc de Triomphe is open only in the afternoon due to the Bastille Day Parade during the morning. You should expect to large crowds at the most popular museums and outdoor attractions - the Louvre, Orsay, Picasso, Catacombs, Centre Pompidou, Paris Zoological Park, Garden of Acclimatization - so consider heading to less well-known venues - Dali Paris, Conciergerie, Palace of Discovery, Guimet Museum, Grand Perfume Museum, Science and Industry Museum, the Museum of Modern Art of the City of Paris. Paris parks including Jardin D'Acclimatation in Bois de Boulogne and Bois de Vincennes/Parc Zoologique de Paris (Vincennes Zoo) are all open, along with some of the larger public swimming pools (Piscine Pontoise in the 5th, Josephine Baker in the 15th, the huge Aquaboulevard in the 15th, Champerret in the 17th, and Georges Vallerey in the 20th). Many neighborhood bakeries and small produce stores will be open (although in the morning only in some cases) so that Parisians can buy picnic supplies; many local residents spend at least part of Bastille Day relaxing in a park with family, friends, food, and wine. The metro and city buses run as usual, except for the station closures around Champs-Élysées and the Eiffel Tower/Champ de Mars mentioned above.